Many believe that it has always been easy for citizens and professionals from one country to visit and settle in the other. However the visa process in the USA is one that will take careful strategizing and many months of planning to ensure your relocation is smooth. Our office has assisted many business people and families move from the UK and Ireland to the USA, however, many people search for not only US Immigration or US Visa guidance but also guidance with the entire process. Before you think of heading to London to visit the US Embassy or plan a trip to the Embassy in Belfast, Northern Ireland or even the consulate in Dublin seeking a longterm visa take the time to consider the following. Note: The following is short guide for Irish and UK citizens looking to move and settle in the US, it is not meant to be a complete guide A-Z but it is a really good place to start and will give you some things to think about and consider! The US has always been considered a land of opportunities and dreams. There are plenty of job and employment opportunities for people with the right set of skills. There is the option to open your own business or move your business from the UK to the USA. This is why hundreds of thousands of people move to the US every year for work, study and business startups. Before you make plans to move, research the demand for the profession and skills that you are looking to take to the US. Unlike Australia and Canada, the US visa process can take sometime depending on which visa process you pursue. Be sure to fully understand your US Immigration options before you start the process. The US and UK have a Visa Waiver Program (also called the ESTA) where citizens from one country can visit the other for a short trip without getting a visa first. Before you decide to move permanently to the country, why not plan on taking a short trip to the US first? During your trip try to find out more about the earnings, cost of living, rents, taxes and saving potential that you will have if you move to the US. Neutrally assess the pros and cons of moving to the US. Decide whether it is the right choice for you. There are two main categories of US visas. Non-immigrant temporary visas are used for tourism, study, business and temporary work. Permanent Immigrant visas are acquired by people looking to move permanently to the US. Depending on your Visa type, you may be required to provide additional documentation such as marriage certificate, degrees qualifications and/or funds to support yourself. This is an area where you need an immigration lawyer to help you understand the specific visa application requirements and advise you on the options for expediting your visa or green card processing. Getting a US Visa is one of the biggest challenges for many people. The USA has a very strict immigration policy, which has only become more stringent under the current president's administration. 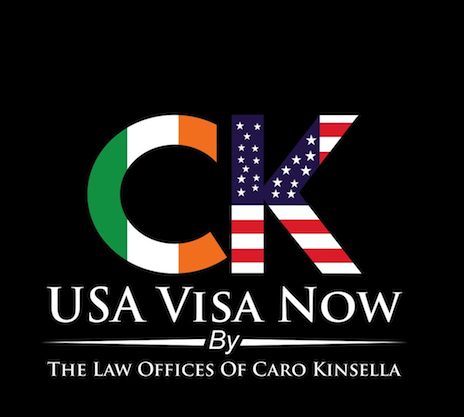 Before you start to apply for visas book in a consultation with our head Attorney Caro Kinsella so that she can evaluate your situation and advise you and your family confirming the best visa route for you. Make sure your passport is up to date. Once your visa is issued, it can only be issued for the validity of your passport. That means if you apply for a 3-year visa or are seeking a 10-year B1/B2 visa but your passport is set to expire in 2 years, then you will only be issued a visa for the 2 years. Therefore, updating your passport before you apply for any US visa is important. Be sure to prepare ahead of time so that you can avoid such problems with your visa. So if you need a new passport, apply for one now. Since Brexit there have been a record number of people applying for Irish passports and processing timelines in Ireland are extended due to this. Be sure to plan ahead! After your visa has been approved, the next step in moving to the US involves the move itself. You would need to make travel arrangements and book temporary lodgings for your stay when you arrive. You would also need to acquire a social security number so that you can open bank account to maintain funds. Moving to a foreign country is said to be one of the more significant life choices you can make. While it is very exciting, rewarding and enriching experience it can be challenging to remember all of the steps involved in an international move. Be sure to plan ahead and start with your visa. The US Visa process can take months - years even so it's important to understand the US Immigration law for your situation and plan ahead. If you are thinking of moving to the US, the best place to start is with a US Immigration consultation, understand the process and the options you have. Our US Immigration law firm specializes in family, business and travel visas to America, we will help make sure your US Immigration rights are fully explained to you so that you can make your move from the UK or Ireland a reality.